**Disclosure: We were treated to complimentary food items in order to conduct an accurate review of Circa 57. No other compensation was received. All opinions are 100% our own. Meal time provides an opportunity to connect with your family and create cherished memories. However, parents may find it a challenge to settle on a restaurant that everyone will enjoy yet will keep the children entertained long enough for the parents to eat. 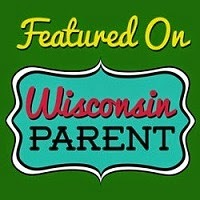 On a recent snowy day, we were invited to take a peek at Circa 57 with the girls in toe. Immediately, the girls were inspired to explore Circa 57. Yes, I mean explore. 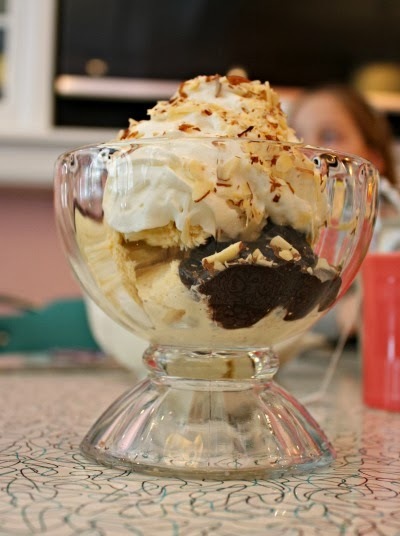 You see, Circa 57 is more than a restaurant but is a trip back to the 1950's when cooking was from scratch, you could sidle up to a soda fountain for a grasshopper and restaurant patrons played tunes on a jukebox. During our visit, we had the pleasure of meeting owners Kimberly and Anthony Priola to learn some behind the scenes information about Circa 57. Thinking about the 1950's inspires thoughts about a time when families did more together. This warm feel of family really came through when speaking to the Priolas. Circa 57 is a family dream from its creation down to the family recipes that populate the menu. The Priolas stress the use of fresh ingredients which is quite comfort to know! As parents, we are concerned about the food our children eat. The Priolas share the same concern in providing quality meals to their large restaurant "family." So, how did Circa 57 become such a treasure trove of 1950's artifacts? Kimberly relayed to us the story of how Anthony learned about the closing of the '57 Heaven Museum in Branson. She initially feared that he would disappear for the auction and return with a number of cars. Instead, he returned with an amazing collection of 1950's memorabilia including a full kitchen---pieces truly from the 1950's. She proudly explained that he has always been an entrepreneur and the dream was born. While we talked with Anthony and Kimberly, we sat in a '50's living room. Yes, a '50's living room complete with a couch with a plastic couch cover! 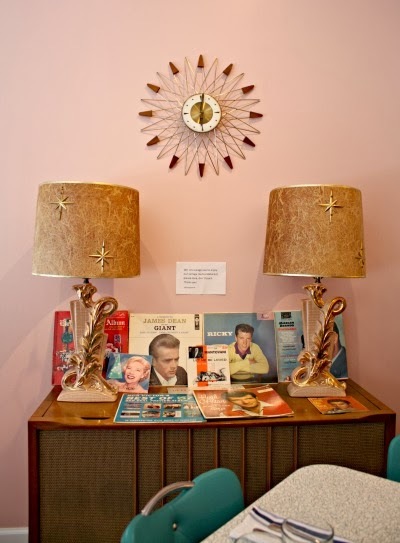 Nearby, we viewed the pink 1950's kitchen and an alcove hiding a pink and blue bathroom. Even though we were eating, we had the warm cozy feel of being in a 1950's bungalow. Such an amazing experience considering we were visiting a restaurant in a busy Chicago suburb! The third section of the restaurant is a bit more refined but still has the '50's feel. This section has a gorgeous wooden bar complete with a soda fountain. 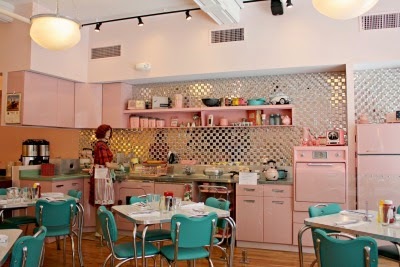 The pink stools still remind you that you are in the '50's. 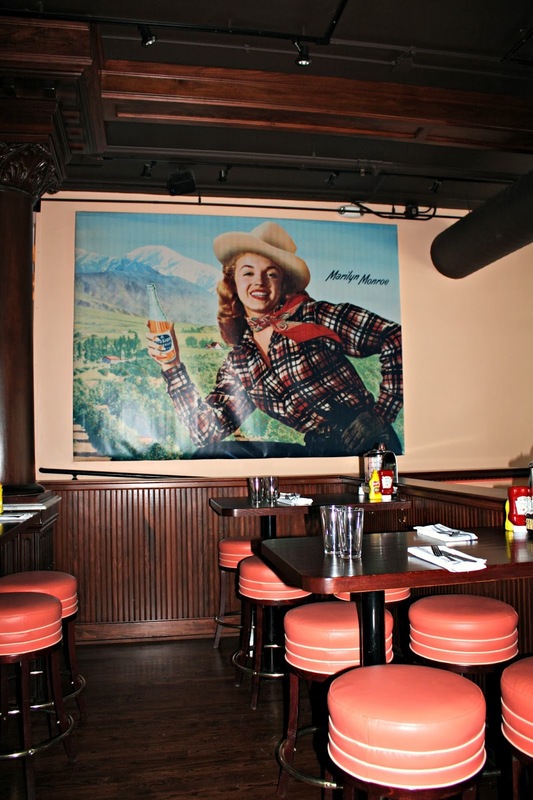 Plus, a wonderful Marilyn Monroe ad graces the wall--how can you not smile! 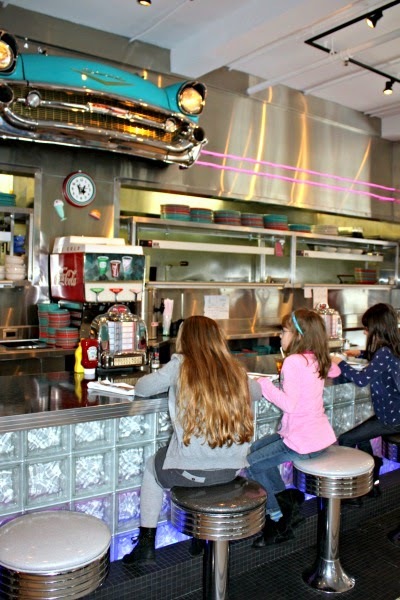 Kat's take: I found Circa 57 to be a great 1950s-themed restaurant; the vintage decor - right down to the working jukeboxes on the soda fountain counter (my daughter's favorite part!) - is amazing to behold. 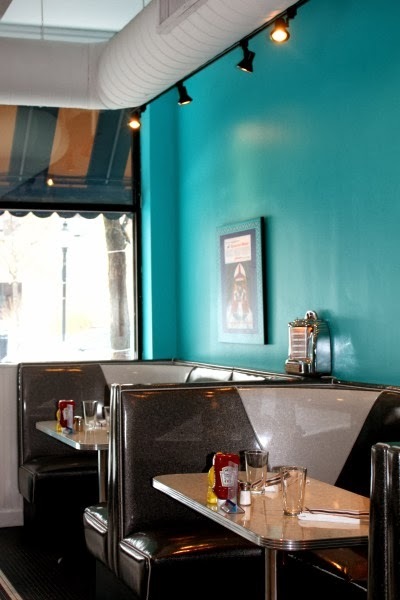 The menu is weighted towards diner-style and classic comfort foods...burgers, pot roast, pulled pork, chicken & waffles, milkshakes, malts, etc. 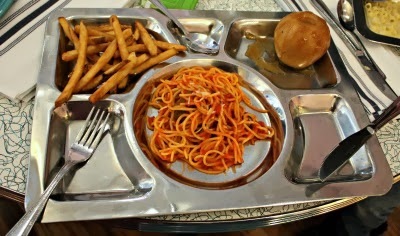 Kids' meals are served on metal TV trays. I enjoyed everything I ate and was happy to find some gluten-free options, which were explained by owners Anthony and Kimberly Priola. The expansive menu, highlighted by some of the owners' time-tested family recipes, is designed to offer more than simple diner fare, however. Indeed there is some fine dining to be had at Circa 57. I wasn't expecting a full bar featuring vintage cocktails, or premium steak and seafood entrees. The prices do reflect those found in a fine dining establishment. But we had a great experience here, which included an excellent server (I think he gave my daughter a quarter for the jukebox!). There's really nothing else like this around, and I think it's a great boon for downtown Arlington Heights. Mel's take: For me, Circa 57 was a bit of an escape from the ordinary yet enveloped by the comfort of family. Our girls were actively interested in the theme and learning about retro pieces that they do not encounter in a normal day. I was a delighted to see my daughter captivated by Circa 57. I also was entirely charmed by the ambiance. The '50's house seemed like the ideal spot for a post wedding brunch or even a bridal shower. I was equally impressed with the size of the menu which branches out beyond diner food. Sure, you can get some of your diner favorites. But, the overall menu was amped up! There are definitely some interesting dishes for the adventurous. 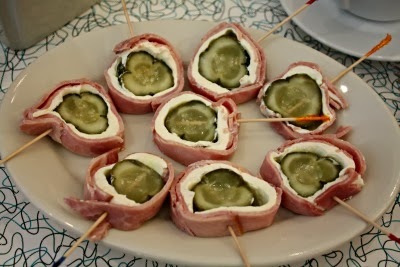 We actually tried the pickle surprise which is a pickle wrapped in cream cheese and ham. It is one of those things that you would not expect to be good but somehow is! I think it is the perfect appetizer for Circa 57 because I can totally picture a '50's housewife serving it to her guests as they lounge on the plastic covered couch! 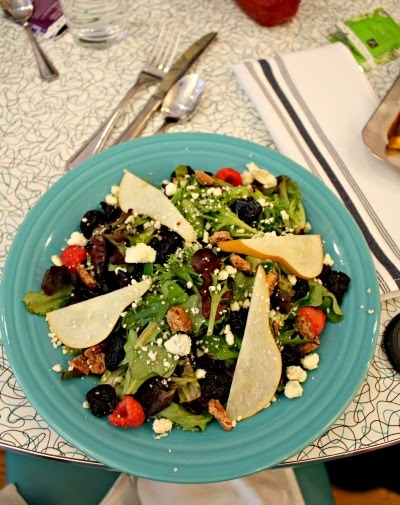 I also had the Fall Harvest Salad which was a delightful mix of lettuces, pear slices, raspberries, candied pecans, dried cherries and bleu cheese all brought together with a raspberry vinaigrette.The only addition I could see to the salad is possibly more pear. 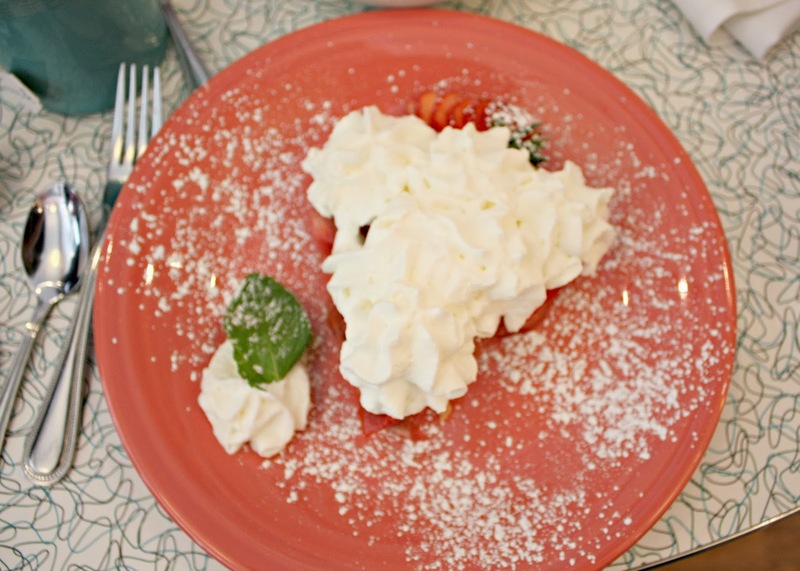 To round out my meal, I dove into the pie of the day--a strawberry pie. Strawberries in the winter---I was spoiled! The first thing that I noticed is that the whipped cream was homemade. I am not a huge whipped cream person but when it is homemade, that is a different story! Great crust, great berries--wonderful pie! Circa 57 is a wonderful addition to Arlington Heights and the suburbs as a whole. The restaurant is open daily for breakfast, lunch and dinner, so you can try quite a variety of meal options easily. Plus, the proximity to the summer concerts will make it an easy dinner stop before the show or a place to pick up takeout for a picnic. Circa 57 has some truly innovative future plans as well. Right now, they will be adding another theme to their restaurant---a drive-in portion where patrons will be able to sit in refabbed vintage cars for dinner. This portion of Circa 57 will have a more upscale, nighttime feel yet be family friendly. Imagine a visit to the drive-in while in the heart of Arlington Heights! I am sure that this portion of the restaurant will be popular so once this portion opens, you will want to put in reservations for the cars! As you can see, Circa 57 is an interactive restaurant like no other. 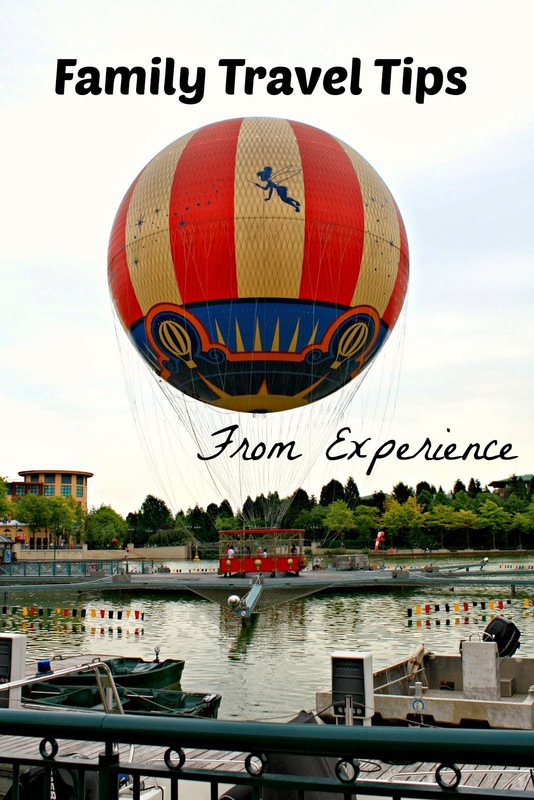 Unparalleled ambiance, great food, a warm, family feel and neat surprises for the future! 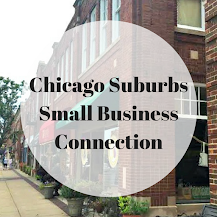 Circa 57 is located at 101 W Campell St in Arlington Heights. 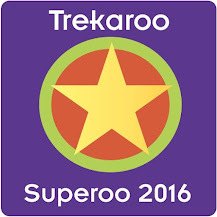 Be sure to follow them on Facebook to keep up with specials!